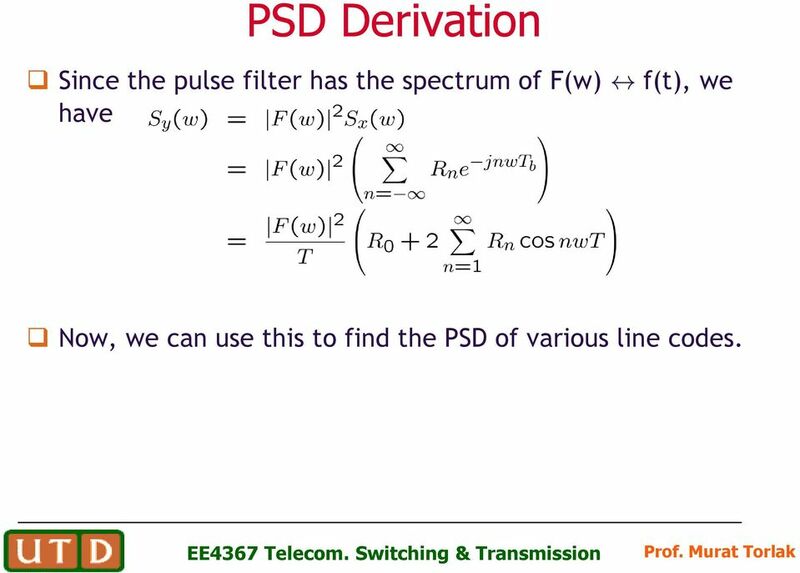 Download "Digital Transmission (Line Coding)"
15 PSD Derivation Since the pulse filter has the spectrum of F(w) f(t), we have Now, we can use this to find the PSD of various line codes. 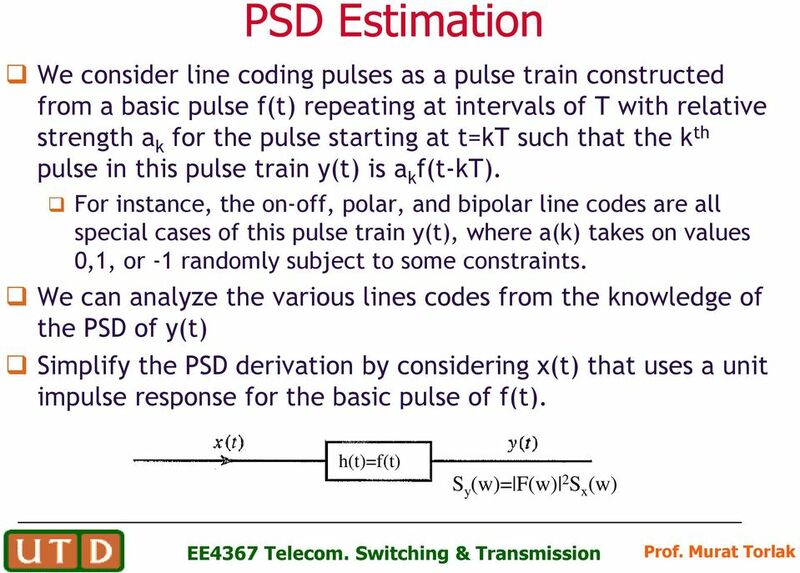 16 PSD of Polar Signaling In polar signaling, binary 1 is transmitted by a pulse f(t) Binary 0 is transmitted by a pulse f(t) In this case, a k is equally likely to be 1 or -1 and a k2 is always 1. There are N pulses and a 2 k2 =1 for each one. The summation on the right-hand side of the above equation is N. Moreover, both a k and a k+1 are either 1 or -1. So, a k a k+1 is either 1 or -1. They are equally likely to be 1 or -1 on the average, out of N terms the product a k a k+1 is equal to 1 for N/2 terms and is equal to -1 for the remaining N/2 terms. 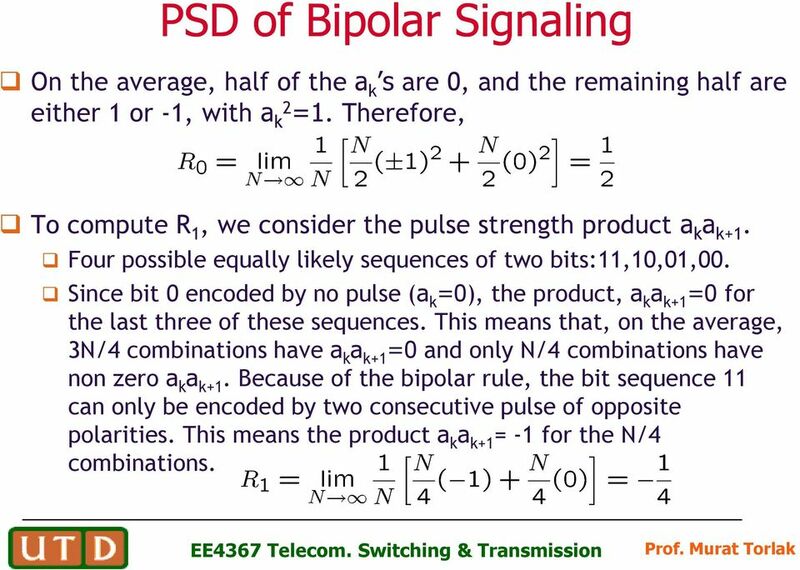 18 PSD of Bipolar Signaling On the average, half of the a k s are 0, and the remaining half are either 1 or -1, with a k2 =1. Therefore, To compute R 1, we consider the pulse strength product a k a k+1. Four possible equally likely sequences of two bits:11,10,01,00. Since bit 0 encoded by no pulse (a k =0), the product, a k a k+1 =0 for the last three of these sequences. This means that, on the average, 3N/4 combinations have a k a k+1 =0 and only N/4 combinations have non zero a k a k+1. Because of the bipolar rule, the bit sequence 11 can only be encoded by two consecutive pulse of opposite polarities. This means the product a k a k+1 = -1 for the N/4 combinations. 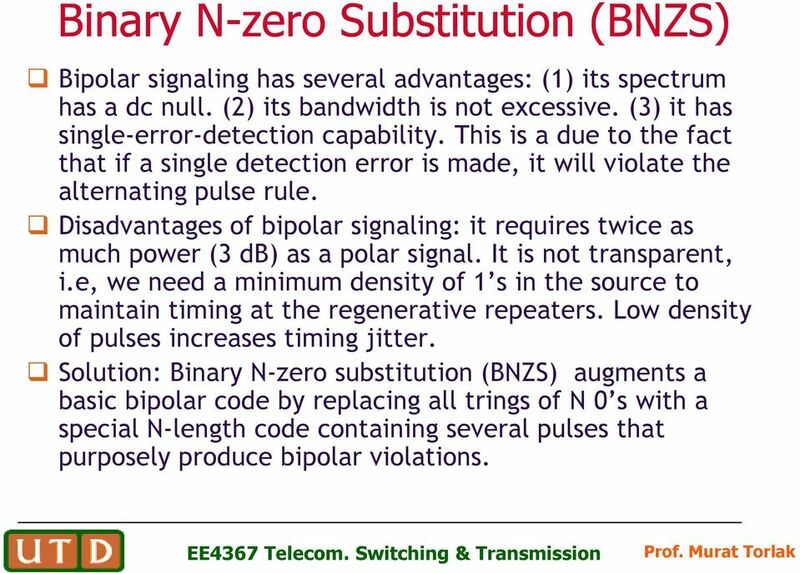 20 Binary N-zero Substitution (BNZS) Bipolar signaling has several advantages: (1) its spectrum has a dc null. (2) its bandwidth is not excessive. (3) it has single-error-detection capability. This is a due to the fact that if a single detection error is made, it will violate the alternating pulse rule. 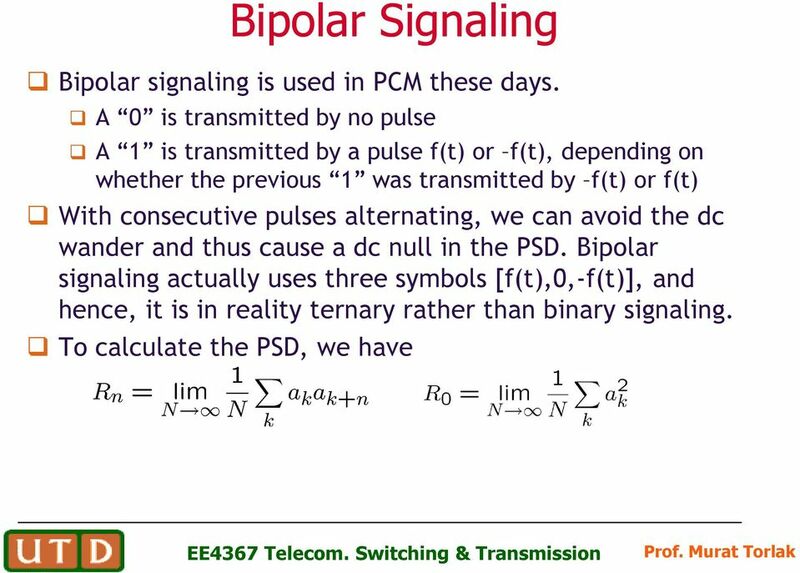 Disadvantages of bipolar signaling: it requires twice as much power (3 db) as a polar signal. It is not transparent, i.e, we need a minimum density of 1 s in the source to maintain timing at the regenerative repeaters. 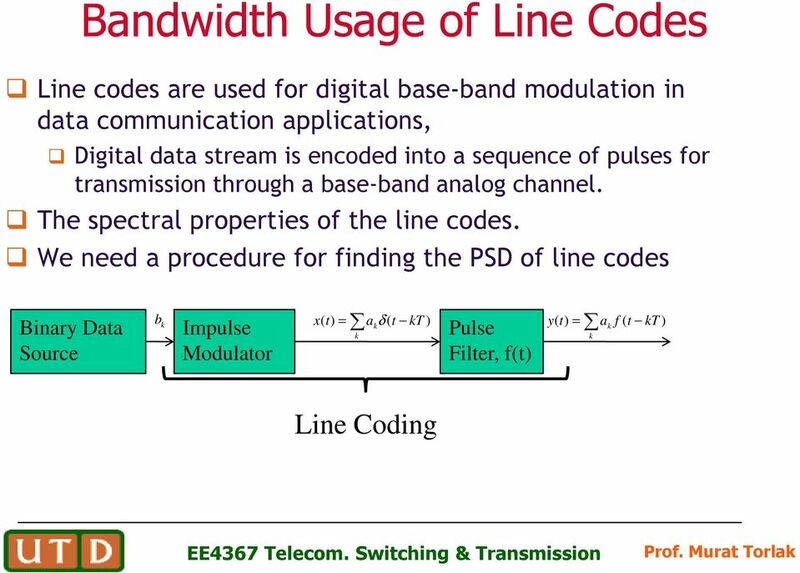 Low density of pulses increases timing jitter. Solution: Binary N-zero substitution (BNZS) augments a basic bipolar code by replacing all trings of N 0 s with a special N-length code containing several pulses that purposely produce bipolar violations. 21 BNZS Line Codes High Density Bipolar (HDB) coding is an example of BNZS coding format. It is used in E1 primary digital signal. HDB coding replaces strings of four 0 s with sequences containing a bipolar violation in the last bit position. Since this coding format precludes strings of 0 s greater than three, it is refereed to as HDB3 coding. 000V and B00V, where B=1 conforms to the bipolar rule and V=1 violates the bipolar rule. The choice of sequence 000V or B00V is made in such a way that consecutive V pulses alternate signs in order to maintain the dc null in PSD. B00V is used when there is an even number of 1 s following the last special sequence 000V is used where there is an odd number of 1 s following the last sequence. 22 B3ZS Line Code B3ZS Algorithm (as used DS-3 signal interface): Each string of three 0 s in the source data is encoded with either 00v or B0V. 23 B8ZS Signaling B8ZS line code is used for T1 (DS1 signals) lines. It replaces any string of eight zeros in length with a sequence of 1 s and 0 s containing two bipolar violations. There are two bipolar violations in every substitution. Similarly, in B6ZS code used in DS2 signals, a string of six zeros is replaced with 0VB0VB. 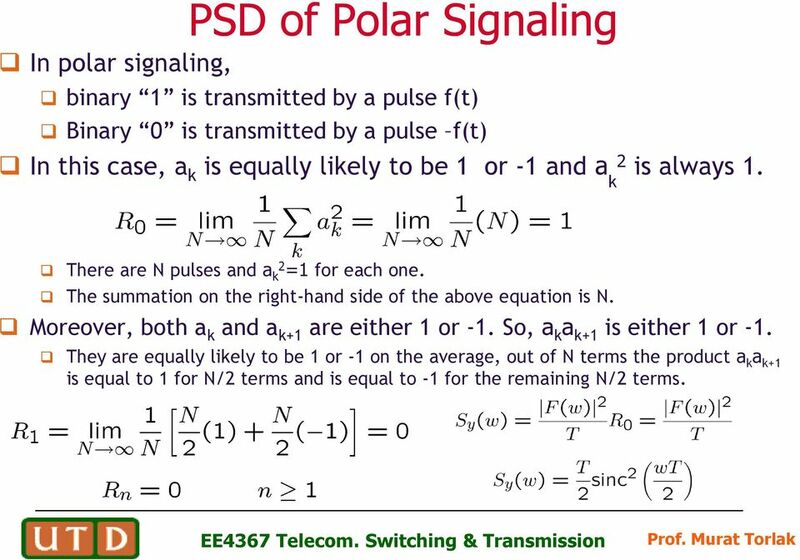 24 Differential Encoding One limitation of polar signaling is that the signal for a 1 is exactly the negative of a signal for a 0. 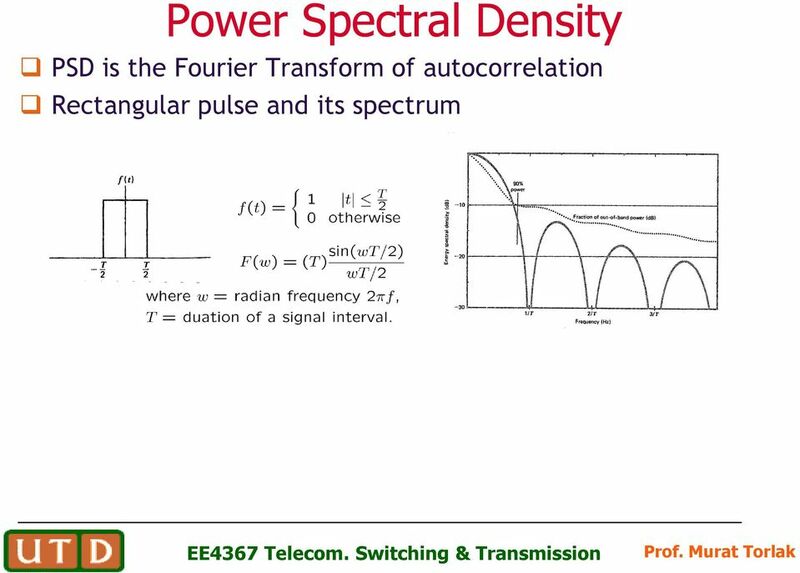 On many transmissions, it may be impossible to determine the exact polarity or an absolute phase reference. The decoder may decode all 1 s as 0 s or vice versa. Common remedy for the phase ambiguity is to use differential encoding that encodes a 1 as a chance of states and encodes a 0 as no change in state. In this way, we do not need absolute phase reference. 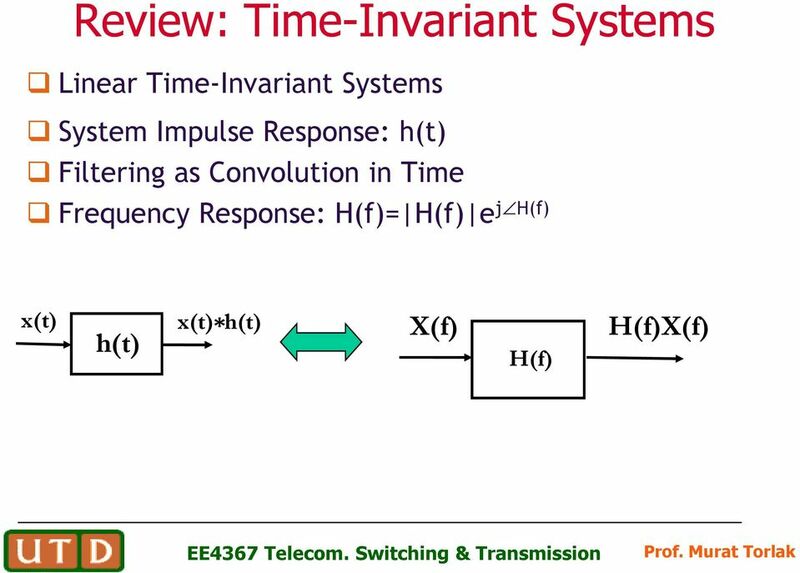 27 Asynchronous vs Synchronous Transmission Asynchronous transmission: Separate transmissions of groups of bits or characters The sample clock is reestablished for each reception Between transmissions an asynchronous line is in idle state. Synchronous transmission: Digital signals are sent continuously at a constant rate The sample clock is established and maintained throughout entire time. 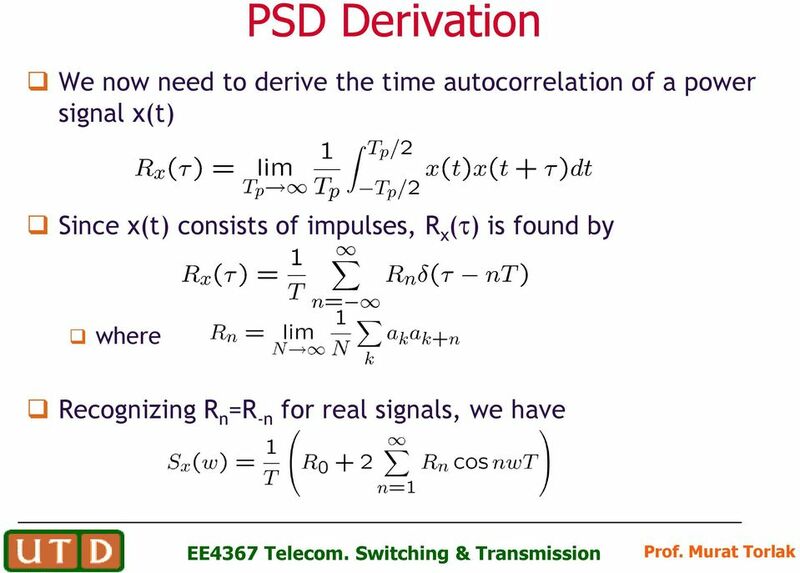 28 Synchronization Consideration Problem of unvarying signal When a signal is unvarying, the receiver cannot determine the beginning and ending of each bit. Take unipolar coding for example. 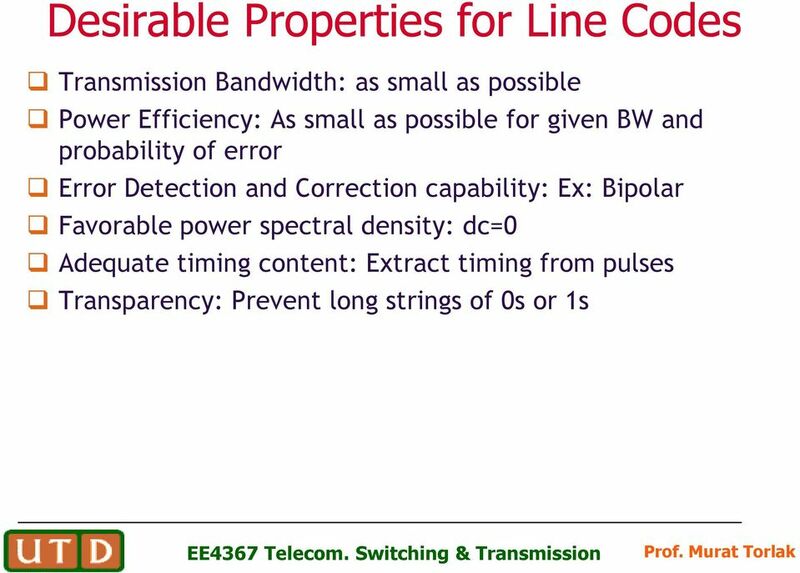 A long uninterrupted series of 1s or 0s can cause synchronization problem. Problem of Using Timers Whenever there is no signal change to indicate the start of the next bit in a sequence, the receiver has to rely on a timer. Given an expected bit rate of 1000 bps, if the receiver detects a positive voltage lasting seconds, it reads one 1 per seconds, or five 1s. However, five 1s can be stretched to second, causing an extra 1 bits to be read by the receiver. That one extra bit in the data stream causes everything after it to be decoded erroneously. 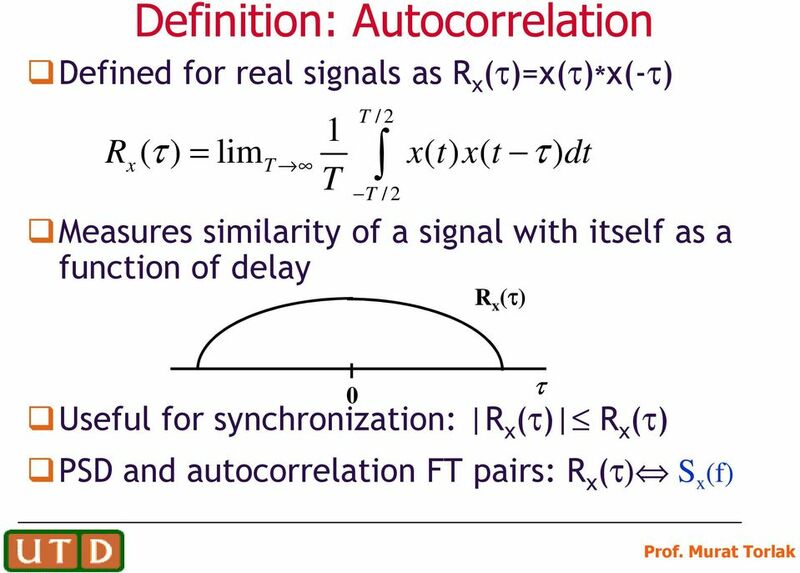 Problem of Having a Separate Clock Line A solution developed to control the synchronization of unipolar transmission is to use a separate, parallel line that carries a clock pulse. 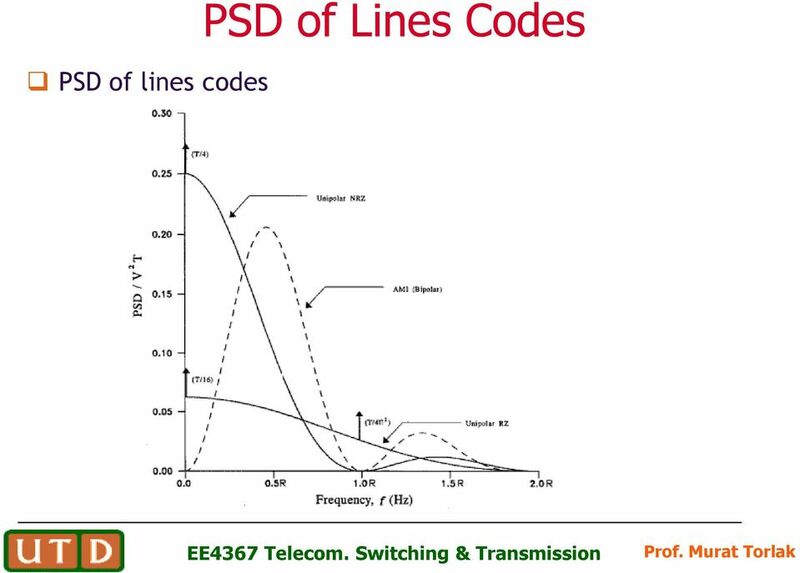 But doubling the number of lines used for transmission increase the cost. 30 Asynchronous Transmission Bits are sent one character at a time. (A character is in general 8 bits in length) Timing or synchronization must only be maintained within each character. The receiver has the opportunity to resynchronize at the beginning of each new character. Start-stop technique Idle state: When no character is being transmitted the line between transmitter and receiver is in an idle state. The definition of idle is by convention, but typically is equivalent to the signaling element for binary 1. Start bit: The beginning of a character is signaled by a start bit with a value of binary 0. Data bits Stop bit: The last bit of the character is followed by a stop bit, which is a binary 1. A minimum length for the stop bit is specified and this is usually 1, 1.5 or 2 times the duration of an ordinary bit. No maximum value is specified, Since the stop bit is the same as the idle state. 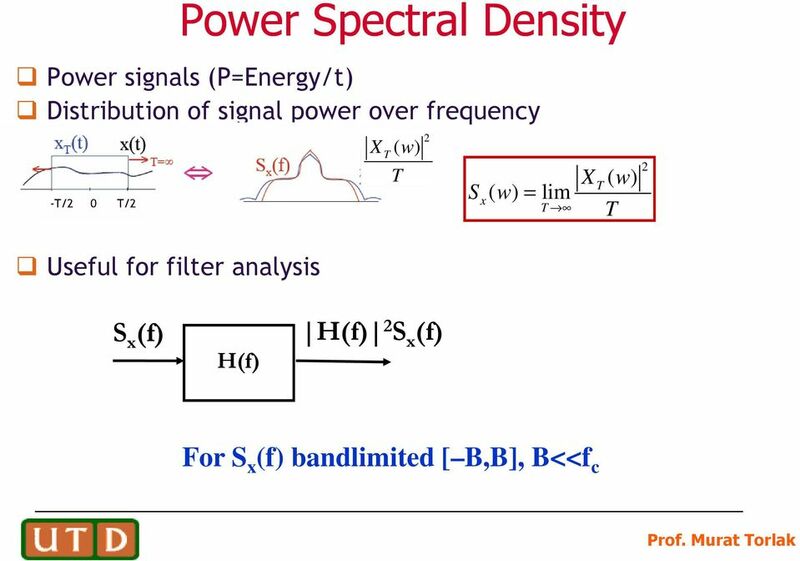 34 Maximum Signaling Rate The percentage of total spectrum power is important measure A major result for digital transmissin pertains to the maximum rate at which pulses can be transmitted over a channel. 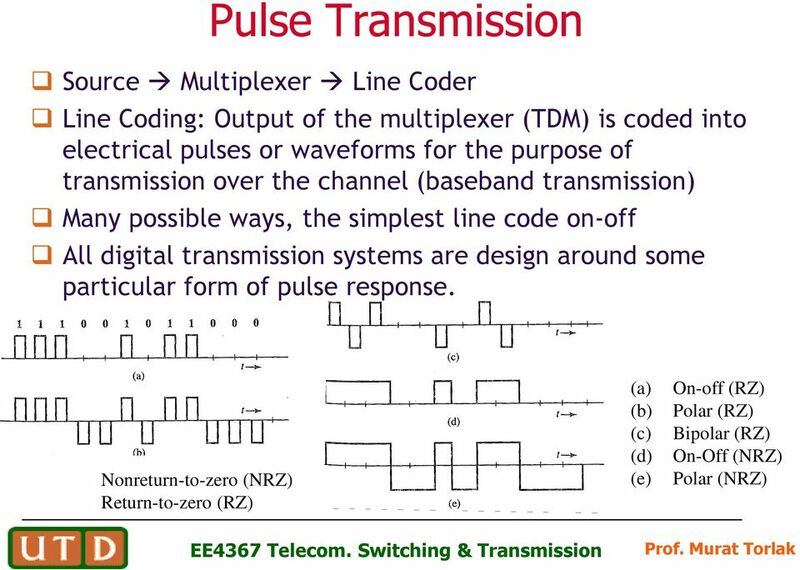 If a channel has bandwidth W, then the narrowest pulse that can be transmitted over the channel has duration T=1/(2W) seconds. 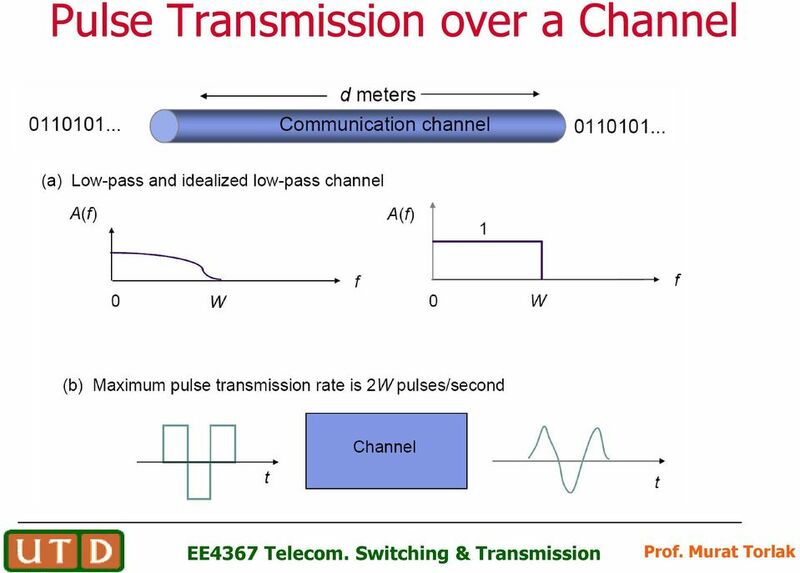 Thus, the maximum rate at which pulses can be transmitted through the channel is given by R max =2 W pulses/second. 36 Multilevel Signaling and Channel Capacity Suppose we increase the number of levels while keeping the maximum signal levels ±A fixed. Each increase in the number of signal levels requires a reduction in the spacing between levels. 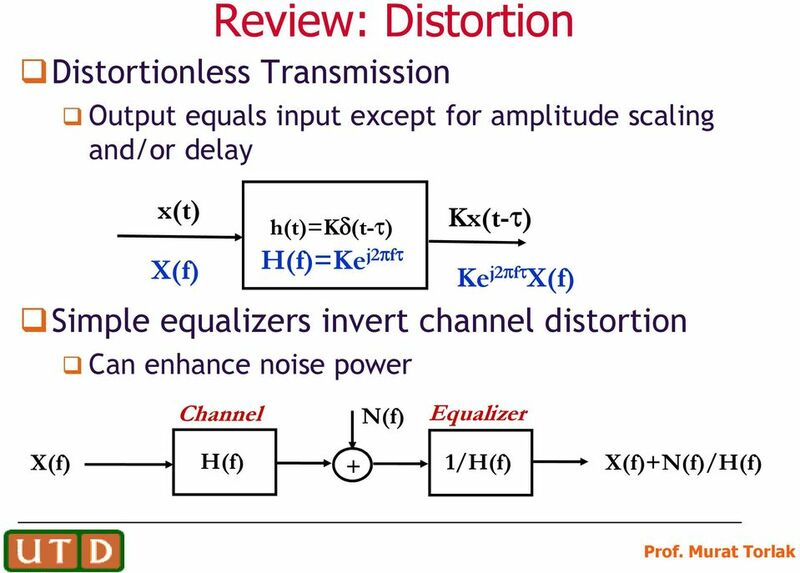 At some point, these reductions will imply significant increases in the probability of detection errors as the noise will be more likely to cause detection errors The channel capacity of a transmission system is the maximum rate at which bits can be transferred reliably. 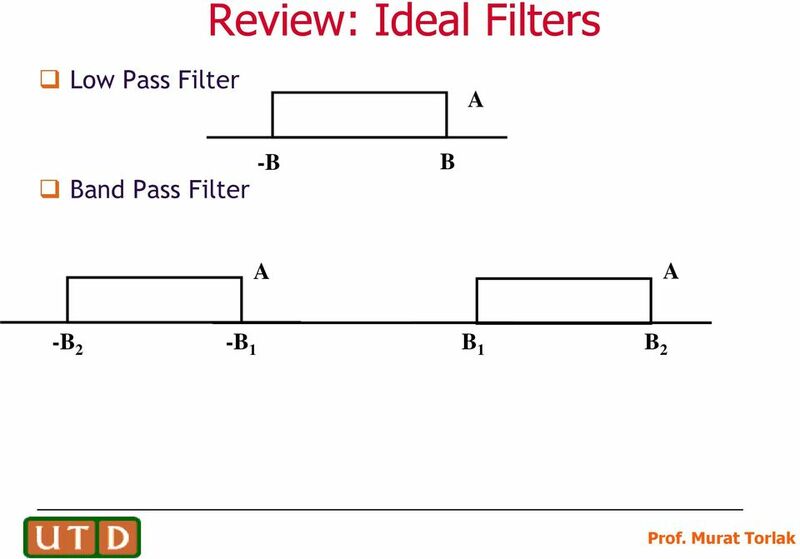 Shannon derived an expression for channel capacity of an ideal low-pass channel. He showed that reliable communication is not possible at rates above this capacity. 39 Error Performance Signal Detection: A decision of which signal was transmitted is made by comparing the measurement (at the appropriate time) to a threshold located halfway between these nominal voltages that represent 0 and 1. Error performance depends on the nominal distance between the voltages and the amount of fluctuation in the measurements caused by noise. In absence of noise, the measurement of the positive pulse would be A and that of negative pulse would be A. Because of noise, these samples would be A+n where n is the random noise amplitude. 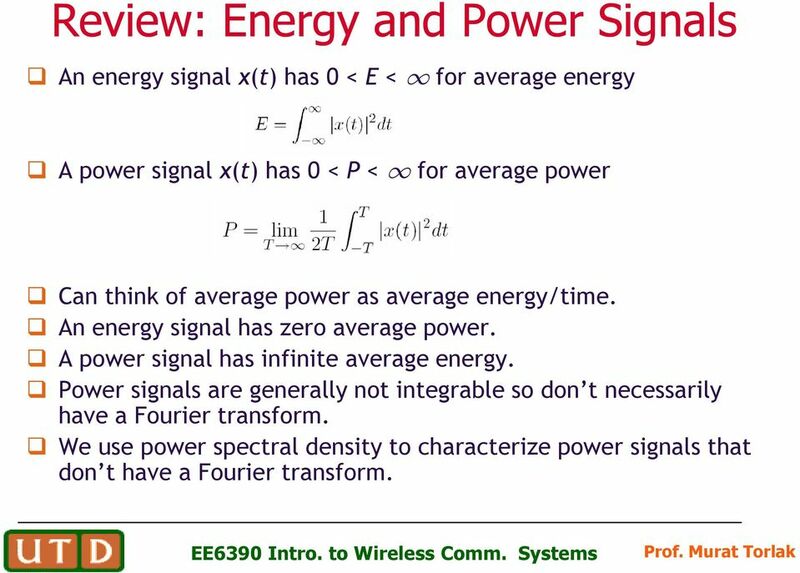 The error performance analysis in communication circuits is typically based on white Gaussian noise. 41 Twisted Pair A twisted pair consists of two wires that are twisted together to reduce the susceptibility to interference. Gauge (diameter) The two-wire system is susceptible to crosstalk and noise since the multiple wires are bundled together.